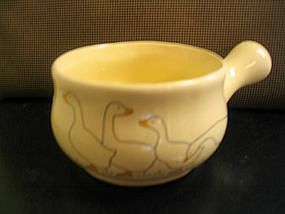 I've had this little casserole long before the geese craze of the late 80's & early 90's. It holds 6 ounces and the geese design is on both sides. There is no manufacturing information. No chips, cracks, breaks or rough areas. There is little to no loss of finish, however, there is a general fine crazing. Additional photos by email. I need your zip code to calculate the postage.